In 2000, Kia was a rental car of last resort. In 2018 it is Asian automotive coolness. How’d that happen? Asian manufacturing excellence is a given, although things do get lost in translation with the Far East’s product design logic. Any industrial engineering analyst could have predicted Kia’s build quality and competitive pricing hierarchy, but it took a German designer to make the cars desirable. That man was former VW and Audi sketcher, Peter Schreyer, who revolutionised the appearance of Kia's, without making them vulnerable imitations of a seasonal European design trend. Schreyer’s success was so absolute that Kia's are now parked with pride outside hip eateries and the man himself, was appointed design director of Hyundai, Kia and Genesis as a reward - An amazing achievement for an outsider in Korea’s notoriously insular corporate culture. Don’t ever underestimate the importance of a skills ecosystem. The German automotive industry achieved dominance because there are deep engineering and design skills which run parallel to it within Germany’s economy and training institutions, offering both technical reference and unconventional solutions. Korea’s ascendance as an electronics supplier of choice to most of the world had an unexpected benefit for its automotive companies, such as Kia. Producing household electronics and Smartphones, where user experience and interface design is crucial, trained a generation of Korean engineers to think towards the future of integrated touchscreens, Smartphone synching and autonomous driving technology. All issues which are pivotal to the automotive industry in 2018 and Kia’s technical people have an excellent grasp of applying user experience (UX) design to making cars ergonomically near flawless, in a world where they have to play nice with Smartphones. Building quality small- and medium-sized vehicles are an achievement, but to establish yourself as a credible brand, there must be a luxury car in your product portfolio. Lexus proved the validity of this when it ambitiously entered America, the world’s most competitive luxury car market, in the early 1990s. Proving it could build a luxury car to rival Germany’s best, Lexus pillared the brand’s perception – which it still leverages off today, nearly three decades later. Kia’s done much the same with its K9 full-size luxury sedan. Although not available in South Africa, the K9 is a wildly ambitious S-Class rival with all Korean componentry, to prove that Kia can do big-car sophistication, if it wants. It also proves Kia’s ability to built big V8 engines, as the range-topping K9 is powered by a 5-litre V8, good for 313kW. Not content with producing its own limousine, the brand’s engineering coherence is also illustrated by Kia’s Stinger GT performance car. Rear-wheel drive and powered by a very potent 272kW 3.3-litre turbocharged V6, this fastback Kia is true to its name a proper Grand Tourer, combining huge luggage capacity (406-litres), with 4.9-second 0-100kph performance. 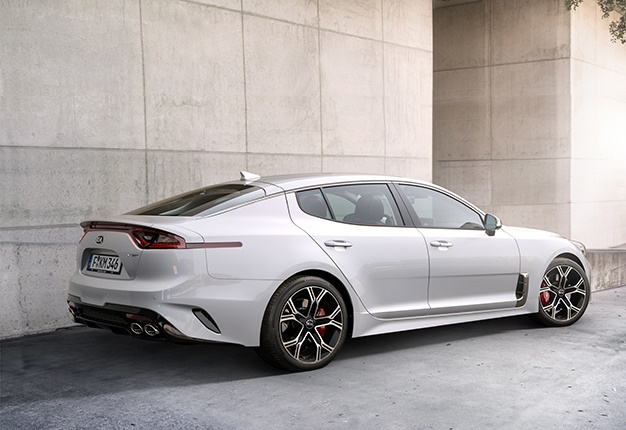 A landmark car in many ways, Stinger GT is also the fastest Kia yet. This is one aspect of Kia’s business that most people tend to forget about. No, there isn’t a double-cab lifestyle bakkie (yet), but Kia has traded the K-series flatbed trucks in South Africa for many years and although they are hardly the most daring of Korean designs, these cab-forward ‘bakkies’ have done a great deal in solidifying Kia’s reputation for reliability. Used by small businesses as logistics and delivery vehicles, and by artisans as their work bakkies, few owners are ever disappointed by the abilities of either K2500 or K2700. If you are having your kitchen remodelled and that in-demand master carpenter arrives in a Kia bakkie, you are sure to take notice and wonder why he isn’t driving a Hilux instead. The result is subliminal conviction marketing of the best type for Kia’s commercial vehicle division.